Over a lifetime, teeth can endure temperatures ranging from freezing to near boiling, biting forces of as much as 150 pounds per square inch and a hostile environment teeming with bacteria. Yet they can still remain healthy for decades. But while they’re rugged, they’re not indestructible — they can incur serious damage from tooth decay or periodontal (gum) disease, two of the most prevalent oral infections. If that happens, you could be faced with the choice of removing the tooth or trying to save it. Because today’s restorations like dental implants are quite durable and amazingly life-like, it might seem the decision is a no-brainer — just rid your mouth of the troubled tooth and replace it. But from a long-term health perspective, it’s usually better for your gums, other teeth and mouth structures to try to save it. How we do that depends on the disease and degree of damage. Tooth decay, for example, starts when high levels of acid soften the minerals in the outer enamel. This creates a hole, or cavity, that we typically treat first by filling with metal amalgam or, increasingly, composite resins color-matched to the tooth. If decay has invaded the pulp (the innermost layer of the tooth), you’ll need a root canal treatment. This procedure removes infected material from the pulp and replaces the empty chamber and the root canals with a special filling to guard against another infection. We then cap the tooth with a life-like crown for added protection. Gum disease, on the other hand, is caused by dental plaque (a thin film of bacteria and food particles on tooth surfaces), and requires a different approach. Here, the strategy is to remove all of the plaque and calculus (hardened plaque deposits) we can find with special hand instruments or ultrasonic equipment, and often over several sessions. If the infection extends deeper or has created deep pockets of disease between the teeth and gums, surgery or more advanced techniques may be necessary. Though effective, some of these treatments can be costly and time-consuming; the tooth itself may be beyond repair. Your best move is to first undergo a complete dental examination. 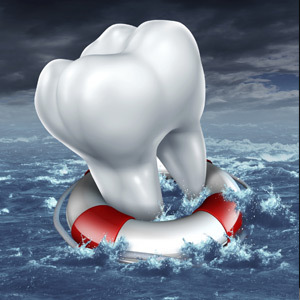 From there, we can give you your best options for dealing with a problem tooth.